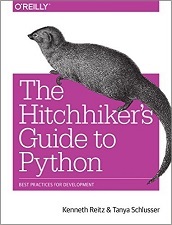 The Hitchhiker's Guide to Python takes the journeyman Pythonista to true expertise. More than any other language, Python was created with the philosophy of simplicity and parsimony. Now 25 years old, Python has become the primary or secondary language (after SQL) for many business users. With popularity comes diversity - and possibly dilution. This guide, collaboratively written by over a hundred members of the Python community, describes best practices currently used by package and application developers. Unlike other books for this audience, The Hitchhiker's Guide is light on reusable code and heavier on design philosophy, directing the reader to excellent sources that already exist. Kenneth Reitz is the product owner of Python at Heroku and a member of the Python Software Foundation. Kenneth focuses on software development, photography, and music production. He is well known for his many open source projects, specifically Requests: HTTP for Humans. Tanya Schlusser is currently an independent consultant who uses data to drive strategic decisions, with over two decades of experience in a half dozen languages. She is an active member of the Chicago Python User's Group, Chicago's PyLadies, and has delivered over 1000 hours of data science training to students and industry analysts.